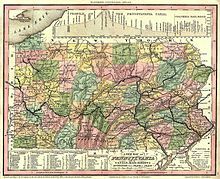 The following is a list of the sixty-seven counties of the U.S. state of Pennsylvania. The city of Philadelphia is coterminous with Philadelphia County, the municipalities having been consolidated in 1854, and all remaining county government functions having been merged into the city after a 1951 referendum. Eight of the ten most populous counties are in the southeastern portion of the state, including four out of the top five, and all of the top ten most populous counties are in either the Philadelphia or Pittsburgh Metropolitan Statistical Areas. ^ Petshek, Kirk R. (1973). The Challenge of Urban Reform. Philadelphia, Pennsylvania: Temple University Press. p. 39. ISBN 978-0-87722-058-9. ^ "City and County Merger Believed OK'd by Voters". The Philadelphia Inquirer. November 7, 1951 – via Newspapers.com. ^ "EPA County FIPS Code Listing". US Environmental Protection Agency. Retrieved July 24, 2007. ^ "EPA County FIPS Code Listing". EPA.gov. Retrieved 2008-02-23. ^ a b c National Association of Counties. "NACo - Find a county". Archived from the original on October 25, 2007. Retrieved 2008-04-30. ^ "Pennsylvania Counties". Pennsylvania State Archives. Archived from the original on 2009-03-06. Retrieved 2009-09-14. ^ Bureau, U.S. Census. "American FactFinder". factfinder2.census.gov. Retrieved 15 April 2018.